Motto: "Antes morrer livres que em paz sujeitos"
1 Location of the Presidency of the Regional Government. 2 Location of the Supreme Court. 3 Location of the Legislative Assembly. The Azores are a Portuguese archipelago in the Atlantic Ocean, about 950 miles from Lisbon and about 2,400 miles from the east coast of North America. The westernmost island (Flores) actually lies on the North American tectonic plate and is only 1,200 miles from St. John's in the Canadian province of Newfoundland and Labrador. The archipelago forms the Autonomous Region of Azores, one of the two autonomous regions of Portugal, the other being Madeira. The nine major Azorean Islands and the eight small Formigas Islands ("ant islands") extend for more than 373 miles, and lie in a northwest-southeast direction. The vast extension of the islands defines an immense exclusive economic zone of 683,508 square miles. All of the islands are of volcanic origin, though Santa Maria also has some reef contribution. The mountain of Pico on Pico Island, at 7,713 feet, is the highest in all of Portugal. The Azores are actually the tops of some of the tallest mountains on the planet, as measured from their base at the bottom of the ocean. There are conflicting theories of the origin of the name. It is commonly said that the archipelago is named after the goshawk bird (Açor in Portuguese). This bird never existed on the islands, but a local subspecies may have been confused for the Açor. Another commonly accepted source is the archaic Portuguese word, "azures," the plural of the word blue, because of the color of the islands when seen from afar. Whatever the source of the name, the Azores are known today for their incredible natural environment and friendly people. Tourism is its most significant industry. This archipelago is located in the middle of the Atlantic Ocean, spread out in the area of the parallel that passes between through Lisbon (39° 43'/39° 55' N) and 37º N. The archipelago lies in the Palearctic eco-zone, forming a unique biome, the macaronesian subtropical laurissilva, with many endemic species of plants. The uniqueness of the islands' ecosystem gives them a very distinctive creative aspect. An abundance of European and Mediterranean originated flora is found, and mixed forests still cover many of the islands' hillsides. The archipelago's nine islands have a total area of 1,463 square miles. Their individual areas vary between 471 square miles (São Miguel) and 10.5 square miles (Corvo). The islands were formed during the Tertiary period by the Azores hotspot, in the Alpine phase, (formed much like the islands of Hawaii). Their volcanic cones and craters reveal the volcanic origin of most islands. The island of Pico has the highest altitude in the Azores, with a volcano rising to 7,713 feet. 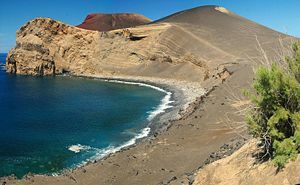 The most recent volcano to erupt was the Capelinhos Volcano in the western part of Faial island, which in 1957 caused an increase in the size of the island. Santa Maria Island is the oldest Azorean island presenting several limestone and red clay extensions. The Azores have a tepid oceanic subtropical climate, with mild annual oscillation and high humidity. The average annual rainfall increases from east to west and ranges from 27.5 to 63 annual inches on average, reaching 248 inches in Pico mountain. The Azores High, also known as the Bermuda High in the United States, is a large subtropical semi-permanent center of high atmospheric pressure found near the Azores, after which it is named. It forms one pole of the North Atlantic oscillation, the other being the Icelandic Low. The system influences the weather and climatic patterns of vast areas of North Africa and Europe. The aridity of the Sahara Desert and Mediterranean Basin is due to the subsidence of air in the system. Formigas Islands (the Portuguese word for ants), also called the Dollabarat Reefs has a vast underwater deep blue ocean scenery that's rich in maritime fauna. It has often been compared to a swimming pool on the middle of the ocean, on which also grows exotic species such as the black coral and swims jamantas, sharks, sea turtles and thousands of other different creatures. 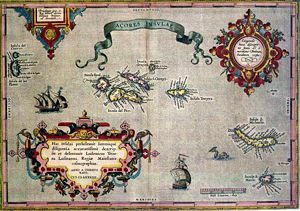 Ancient map of the Azores Islands. The islands were known in the fourteenth century and can be seen incompletely, for example, in the Atlas Catalan. In 1427, one of the captains sailing for Henry the Navigator rediscovered the Azores, possibly Gonçalo Velho, but this is not certain. The colonization of the then-unoccupied islands began in 1439, with people mainly from the continental provinces of Algarve and Alentejo. In 1583, Philip II of Spain as king of Portugal, sent his combined Iberian fleet to clear the French traders from the Azores, hanging his prisoners-of-war from the yardarms and contributing to the "Black Legend." The Azores were the second-to-last part of the Portuguese empire to resist Philip's reign over Portugal (Macau being the last). Azores was returned to Portuguese control with the end of the Iberian Union, not by the military efforts, as these were already in Restoration War efforts in the mainland, but by the people attacking a well-fortified Castillian garrison. The 1820, civil war in Portugal had strong repercussions in the Azores. In 1829, in Vila da Praia, the liberals won over the absolutists, making Terceira Island the main headquarters of the new Portuguese regime and also where the Council of Regency of Mary II of Portugal was established. From 1836 to 1976, the archipelago was divided into three districts, quite equivalent (except in area) to those in the Portuguese mainland. The division was arbitrary, and didn't follow the natural island groups, rather reflecting the location of each district capital on the three main cities (neither of each on the western group). Angra consisted of Terceira, São Jorge, and Graciosa, with the capital at Angra do Heroísmo on Terceira. During the Second World War, in 1943, Portuguese dictator António de Oliveira Salazar leased bases in the Azores to the British. This represented a change in policy. Previously, the Portuguese government only allowed German U-boats and navy ships to refuel there. This was a key turning point in the Battle of the Atlantic, allowing the Allies to provide aerial coverage in the middle of the Atlantic, helping them to hunt U-boats and protect convoys. In 1944, American forces constructed a small and short-lived air base on the island of Santa Maria. In 1945, a new base was founded on the island of Terceira and is currently known as Lajes Field. It was founded in an area called Lajes, a broad, flat sea terrace that had been a farm. Lajes Field is a plateau rising out of the sea on the north east corner of the island. This air force base is a joint American and Portuguese venture. Lajes Field continues to support U.S. and Portuguese military operations. During the Cold War, the U.S. Navy P-3 Orion anti-submarine squadrons patrolled the North Atlantic for Soviet submarines and surface spy vessels. Since its inception, Lajes Field has been used for refueling aircraft bound for Europe, and more recently, the Middle East. The U.S. Army operates a small fleet of military ships—probably Maritime Prepositioning Ships—in the harbor of Praia da Vitória, 1.8 miles south east of Lajes Field. The airfield also has a small commercial terminal handling scheduled and chartered passenger flights from other islands in the archipelago, Europe, and North America. In 1976, the Azores became the Autonomous Region of the Azores (Região Autónoma dos Açores), one of the Autonomous regions of Portugal, and the Azorean districts were suppressed. Since becoming a Portuguese Autonomous Region, the executive section of the local authority has been located in Ponta Delgada, the legislative in Horta and the judicial in Angra do Heroísmo. The President of the Regional Government as of 2007, was Carlos César. Azorean politics are dominated by the two largest Portuguese political parties—PSD and PS (socialist parties), the latter holding a majority in the Regional Legislative Assembly. The CDS/PP is also represented in the local parliament. Even though the PS dominates the administrative scene, the PSD is usually more popular in city and town council elections. The Azores are divided into nineteen municipalities, each municipality is further divided into parishes. There are a total of 156 parishes in all of the Azores. There are also five cities: Ponta Delgada and Ribeira Grande on São Miguel Island; Angra do Heroísmo and Praia da Vitória on Terceira, and Horta on Faial. The vast majority of the inhabitants of the Azores are Portuguese, descendants of fifteenth century immigrants from Algarve (Southern Portugal) and from the Minho in Northern Portugal, with a minor Dutch admixture (particularly from Flanders). They are predominantly Roman Catholic. High population density and limited economic opportunities, in large part due to their geographic isolation, prompted extensive emigration, mainly to Brazil, the U.S., and Canada. In recent years the islands' isolation has diminished and communications considerably improved. Every island has an airport or airstrip. From the time the Azores were populated, the people hunted whales for oil. They experienced such success that every major Atlantic whaling expedition would stop in the Azores. In 1979, Portugal outlawed whaling, even though the annual Azorean catch was exceeded by a single Japanese whale factory ship. Only sperm whales were hunted because they are the only species which floats when dead. At that time, the deep waters around the archipelago were designated a natural reserve. The income lost from the whaling industry was soon replaced by eco-tourism of whale and marine-life watching. Those who had once been whalers became guides, whale spotters, or museum hosts. Lookout towers situated in strategic positions high on the mountains once used for whaling have been converted to watching stations for tourists. The Azorean culture has a hierarchy of loyalty. Firstly to the family, which is the most important unit in the society. Every member is expected to contribute to the entire family's well-being. The father is the head of the family and makes the important decisions. Both land and farm animals are passed down to successive generations. The second loyalty is to the village, a network of families, many of whom are interrelated by marriage. All families within a village look out for one another and contribute assistance when needed. The third tier of loyalty is to the island on which one lives. Each island has a certain uniqueness about it. Topography, celebrations, dialects and industry differ from island to island. Generally, Azoreans are known as a happy people who are very connected to the natural environment surrounding them. Petropoulos, Jonathan. 1997. Co-Opting Nazi Germany: Neutrality in Europe During World War II. Anti-Defamation League. Retrieved December 15, 2007. Santos, Robert L. 1995. Azores Islands Alley-Cass Publications. Retrieved December 15, 2007. The Azores Islands. Dolphin and Whale Watching—Azores. Retrieved December 12, 2007. Azores Travel Guide Epic Trip. Photos from Sao Miguel and Terceira, Azores Flickr. This page was last modified on 5 May 2016, at 14:20.